A magical season is arriving in the Porkies. As temperatures begin to cool, our area becomes a blaze of fall color. Lake Superior provides a shimmering blue contrast to the brilliant foliage. The lake warms the air, causing the trees here to hold their color longer into the season. Take a walk on a woodland path on a carpet of newly-fallen leaves. Build a fire on the beach and watch the sun set. Drive down a winding forest road as yellow leaves gently drift to earth. This is why you’re here. Enjoy every minute of fall in the Porkies. Now is the perfect time to plan a trip to experience the full beauty of Porkies. Here are three driving routes to experience while you’re here. This 120-mile loop will take you through the vast Ottawa National Forest and some incredible fall color. You’ll pass some gorgeous waterfalls along the way. Leaving Silver City, take the 107th Engineers Memorial Highway, then head south on South Boundary Road. You’ll pass Little Union Gorge Falls and then five miles later, Nonesuch Falls. They are both well worth a stop. 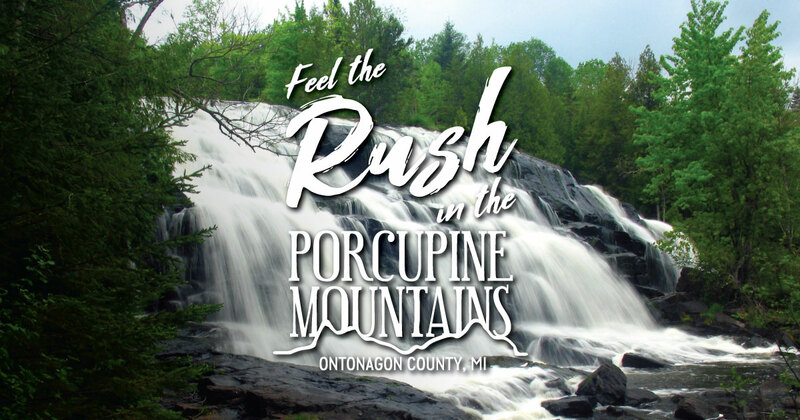 Continue west on South Boundary and where the road bends south at the westernmost edge of the Porcupine Mountains Wilderness State Park, you’ll pass near three outstanding waterfalls on the Presque Isle River—Manabezho, Manido, and Nawadaha. From here, continue south on County Road 519 to Wakefield. Then head east on M-28 to Bergland, located on the northern shore of Lake Gogebic. From Bergland, head north on M-64 back to Silver City. For a shorter, spectacular trip that departs from White Pine, take M-64 north to the shore of Lake Superior. Head west on the 107th Engineers Memorial Hwy and head into the Porcupine Mountains Wilderness State Park. When you get into the park, you’ll want to get out of the car. A short walk on an ADA access trail will take you to a spectacular lookout above the iconic Lake of the Clouds. The view is always impressive but in the fall, it’s particularly breathtaking. Head back down the way you came, enjoying every mile of the drive. This route includes some breathtaking fall Lake Superior vistas and scenic highways through the Ottawa National Forest. From Ontonagon, head west on M-64 to Silver City, then head south on M-64, then south to Bergland. Head east along M-28, passing through Ewen and connecting with Highway 45 at Bruce Crossing. Go north on Highway 45 to Rockland, then continue north back to Ontonagon.